With one in ten people (10% of the population) in the world affected by lower back pain, most of them are worried about how to get rid of it. Thankfully, there are several simple home remedies for back pain. 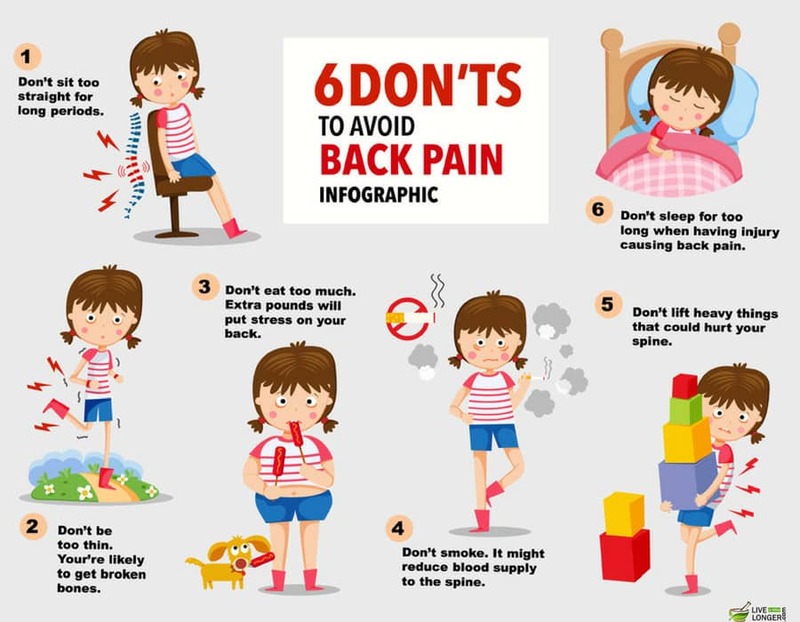 Maybe you lifted something heavy without balancing properly, or you suffer from arthritis, whatever the causes, back pain is something difficult to put up with and sometimes the agonizing pain is quite unbearable. Sometimes, back ache can turn out to be serious if numbness is experienced in lower back region or if a tingling sensation is felt in the legs. These instances however, are quite rare and it is mostly mild to severe back pain that bothers most of the people. Thankfully there are several easy home remedies for back pain. Sometimes, backache can turn out to be serious if numbness is experienced in the lower back region or if a tingling sensation is felt in the legs. These instances, however, are quite rare and it is mostly mild to severe back pain that bothers most of the people and check for more ergonomically designed products like masahepanda.com and back pain mattress . Thankfully there are several easy home remedies for back pain. Take a handful of ice cubes from the fridge. Bundle up the ice cubes in a polythene bag. Apply the cold compress on the painful areas. Continue the process for 15 to 20 minutes. Repeat the process once or twice daily. The coldness caused by the ice cubes has a soothing effect on the pain. It enhances circulation in the underlying tissue and muscle and helps get relief from the pain. Applying a cold compress helps bring down the temperature surrounding the lower back area and causes a temporary numbness that helps alleviate the pain. It also prevents the blood from clotting in the region and helps gain immense relief. An ice pack is one of the best home remedies for back pain. The pain is too severe and the person is immobilized by the pain. In such cases consult your doctor immediately. Get either John’s wort oil or Narayana Ayurvedic oil. Apply the oil on the painful areas. Have someone massage the oil for 10 to 15 minutes. Professional masseuses can give expert massages. Continue the process for 3 to 4 days. Ayurvedic massage oil is prepared using herbs like Ashwagandha, camphor and black sesame oil. These herbs act on the pain and give relief very fast. St. John’s wort oil is prepared from fresh flowers of the Hypericum perforatum plant that grows in a very wild habitat. The leaves and flowers of the plant are handpicked to ensure that quality is maintained. This oil has some amazing anti-inflammatory and pain killing properties that give almost instant relief from back pain. Massage therapy is probably the safest and most effective of all home remedies for back pain. The massage is given by an inexperienced person and leads to further complications. In such cases consult your doctor immediately. Yoga Asanas can help cure back pain easily. Practice Marjaryasana or the cat pose. Try to perfect the Bakasana or crow pose. Attempt the Setu Bandhana Asana or the bridge pose. Practice the Dhanur Asana or the bow pose. There is no doubt that practicing Yoga Asanas help us maintain our bodies in peak condition and helps ward off diseases as well as aches and pains. The Marjaryasana pose or the cat like stance is an easy 3-step asana that is done by stretching the body just the way a cat stretches. It helps stretch the muscles and nerves and offers instant relief from back pain. Similarly, Bakasana or the crow (crane) pose is good for curing chronic back pain. Although it appears very difficult, it can be perfected with practice. 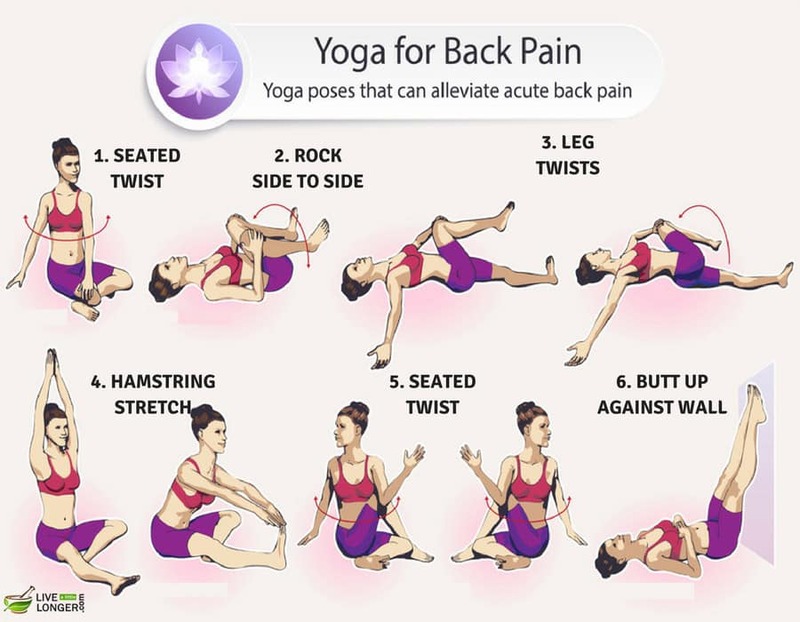 Apart from these, Setu Bandhana Asana or the bridge pose and Dhanur Asana or the bow pose are good for treating back pain. Yoga asanas are certainly one of the best home remedies for the natural treatment of back pain. The Yoga poses are not executed correctly, as wrong postures can worsen the situation. It is better to learn from a qualified instructor or from reliable tutorials. Set up a regimen of calorie burning exercises. Cycling, swimming, jogging and brisk walking are recommended. Keep an eye on your diet and shun calorie-rich foods. Avoid deep fried foods as well as ice creams and other fatty foods. Eat lightly, especially before going to bed. Excess weight is bad for general health and is very harmful for the heart. When the weight of the body is not proportionate to the frame, there is a mismatch. People with large bellies tend to place extra strain on their backs (the weight of the stomach pulls down) which leads to developing severe back pain. 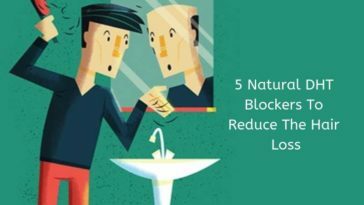 Hence losing weight is very important for prevent lower back pain. Exercise and losing weight make a great natural treatment for back pain. You go on a crash diet and are left with hardly enough energy to maintain the body’s day-to-day activities. Take care while planning your diet, if required consult an expert nutritionist. Don’t slouch, and sit with an erect posture. Try not to sit at your desk for long periods of time. Take short breaks frequently and stretch and bend. Don’t walk with hunched shoulders, walk at a brisk pace. Most people are in sedentary jobs where they spend most of the time sitting at their desks. People tend to slouch and sit with a wrong posture which puts more strain on the lower back. Over a period of time, the strain becomes too much and results in degeneration of disks or dislocation of disks at the slightest provocation. Similarly, it is important to remain erect while standing, and even while walking one should have an erect stance and a brisk gait. 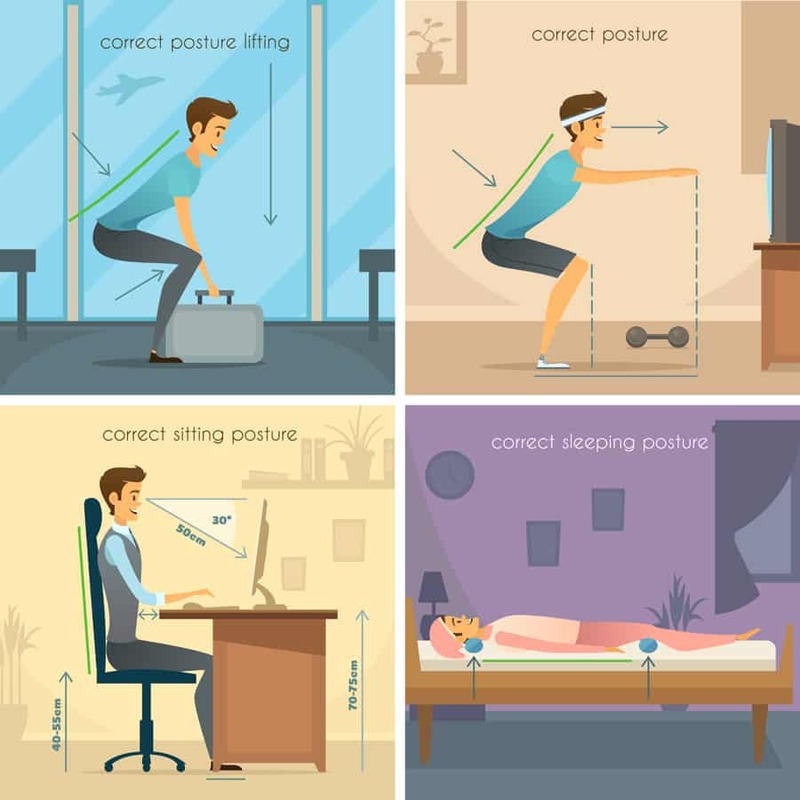 Maintaining correct posture will certainly offer an answer to the question we ask ourselves often – how to get rid of back pain? There is no reason why this remedy should not be good. 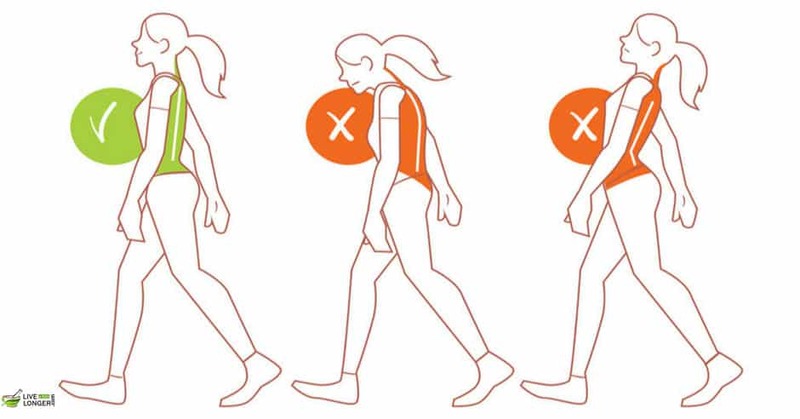 Good posture while sitting and walking are important to ward off back pain. Get a bottle of Christopher’s Garlic Oil. Take one teaspoon and apply on the painful areas. 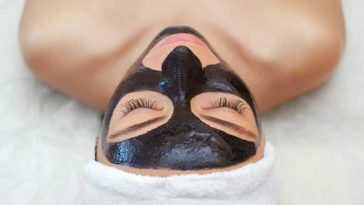 Gently massage for 10 minutes until oil is absorbed. Garlic is an amazing herb that has many curative properties. Apart from being an effective anti-inflammatory, it helps in getting rid of chronic back pain by working on the muscle and tissue to relieve pain. Garlic is also an excellent antioxidant and is used as a digestive aid as well. Garlic oil massage is a very natural treatment for back pain. Your skin is very sensitive as garlic oil can be a bit harsh on the skin. If there is any burning sensation, discontinue the treatment and consult your physician. Get a tube of Capsaicin Cream. Apply the capsaicin cream/ointment on painful areas. Rub until the cream is absorbed. Capsaicin cream is extracted from chili peppers as it is found abundantly in this hot spice. When capsaicin cream is applied topically, it generates immense heat in the body. The substance P that is present in capsaicin cream is responsible for transmitting the pain signals. It creates an analgesic effect and helps gain relief from back pain. Capsaicin cream is one of the best home remedies for backache. There is no reason why this remedy should not be good. However, if the pain becomes severe do consult your physiotherapist or physician. Take a finger or fresh ginger root. Wash and peel and chop into fine pieces. Boil a glass of water in a small bowl. Add the chopped ginger and allow it to steep for 10 minutes. Strain and add a teaspoon of pure, organic honey. Drink the ginger tea while it is hot. Ginger is a wonder herb and a lot of research has gone into the benefits it has as an anti-inflammatory agent. It has been advocated as a great cure for pain caused by severe arthritis and by osteoarthritis. Ginger is known to have a soothing effect on the affected muscles, tissues and bones and gives instant relief from intense back pain. Ginger can be consumed as raw juice as well; however boiling ginger in plain water and making tea is more effective and palatable as well. Honey is added to reduce the pungent taste of ginger. Drinking Ginger tea is an effective natural treatment for back pain. Boil two teaspoons of White Willow Bark Powder in 2 glasses of water. Allow it to steep for 10 minutes. Strain and drink one glass while it is hot. White Willow bark powder has been used in fold medicine for treating various ailments. It has especially been recommended for treating various aches and pains, thus it is very effective in treating chronic back pain. The phenolic glycosides present in White Willow bark along with salicin act as natural anti-inflammatory agents and help relieve the pain in the lower back due to sciatica and other reasons. White Willow bark powder is one of the best natural home remedies for back pain. Take 2 to 3 cups of Epsom salt. Bundle it up in soft muslin cloth. Fill up your bathtub (half) with warm water. Tie up the bundled Epsom salt under the faucet. Allow water to run through the Epsom salt. Soak in the bathtub for 30 minutes to 1 hour. Epsom salt is a naturally occurring mineral that is found in the natural springs located in Epsom village located in Surrey County, UK. Epsom salt is rich in minerals and contains magnesium sulfate that acts as a soothing balm on aches and pains. As magnesium is not produced in our body naturally, an Epsom salt soak is essential to get rid of troublesome back pains. Epsom salt is one of the most effective home remedies for back pain. 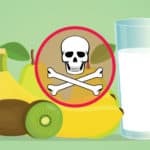 Weight loss remedy is good for all? Because my weight is already below the average. It was not for all.It is for fat people.You may try other remedies. What are the treatments for upper and middle back pain? I am 28 years old. Six months ago I started having severe cramps in my left leg and back, which kept me in bed for one whole weeks. Eventually the cramps disappeared but I was left with constant numbness and tingling in my left calf and foot. X-rays confirmed a problem with my sciatic nerve. Can you tell me what to do to relieve the constant ache and numbness in my calf and foot? Also, my lower back has been weak and I am unable to resume a regular exercise program. Can i still play basketball? Based on your description, it is possible that you have a pinched nerve (nerve compression). Conservative treatment will consist of physiotherapy and pain-killers. Exercises that strengthen your abdominal and lower back muscles are helpful. You can still play basketball, but you should stop if it causes you pain or do it in moderation. If your symptoms persist, you should consult a doctor. Further investigations such MRI scans may help elucidate the condition. Dear Sir, my colleague is 56 years old and she is suffering from severe back pain for the past 3 years. According to her MRI report, there is a bruised on her spine from C2 to C7, and damage on the spinal cord. She had consulted the local doctors, and took pills regularly. She also tried massaging and physiotherapy, but it didn’t help. Should my colleague go for a surgery? Is it safe to have a surgery at the age of 56? Kindly advise. It is difficult to determine if your colleague needs surgery based on MRI report alone. Based on the report, if there is spinal cord damage, she should be seen by a Spine Specialist to check her signs and symptoms and interpret her MRI scans accordingly. If she requires surgery, the specialist will be able to advise. Before proceeding with surgery, investigations will be performed to determine if she is fit for operation. That’s true Aaliya Smith it’s better for us to go in the natural way rather than trying and moving to unconventional methods. I have tried some remedies like ice pack and yoga,it gives me a good result.Thanks for the article.